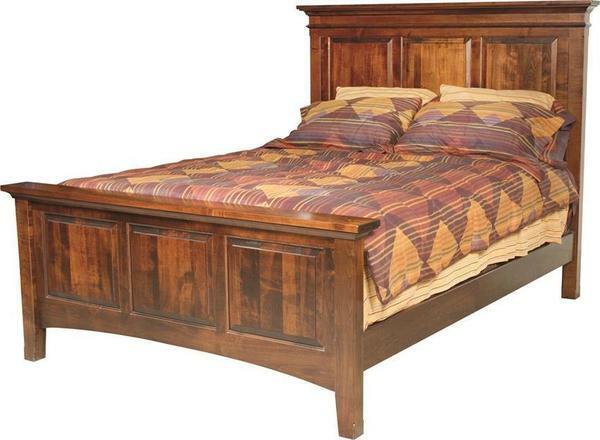 Chock full of rustic charm, our handcrafted Bangor Bed is sure to make a statement in the center of any bedroom suite. The shabby chic style is transitional enough to complement any decor, offering big, bold panels throughout the head and foot board, accented with a large top trim molding and thick square legs - bringing with it the natural warmth of the solid hardwood and the integrity of Amish craftsmanship. Once complete, the Bangor Bed is sure to offer a lifetime of beauty and support, with enough brawn to serve many generations after. Choose from any standard size, from twin to king, to ensure the proper fit in your suite of choice. From there, you can select from a wide array of wood and finish options that will allow you the perfect tone to complement your suite. With our Bangor Bed, you can count on a centerpiece for your suite that you'll fall in love with every time you step foot in your bedroom.